Buddhists pursue meditation as part of the path toward liberation, awakening and Nirvana,[note 3] and includes a variety of meditation techniques, most notably asubha bhavana ("reflections on repulsiveness"); reflection on pratityasamutpada (dependent origination); sati (mindfulness) and anussati (recollections), including anapanasati (breath meditation); dhyana (developing an alert and luminous mind); and the Brahma-viharas (loving-kindness and compassion). These techniques aim to develop equanimity and sati (mindfulness); samadhi (concentration) c.q. samatha (tranquility) and vipassanā (insight); and are also said to lead to abhijñā (supramundane powers). These meditation techniques are preceded by and combined with practices which aid this development, such as moral restraint and right effort to develop wholesome states of mind. Modern Buddhist studies has attempted to reconstruct the meditation practices of pre-sectarian Early Buddhism, mainly through philological and text critical methods using the early canonical texts. The Vitakkasanthāna Sutta of the Majjhima Nikāya and its parallels in Chinese translation recommend the practicing monk to ‘restrain his thought with his mind, to coerce and torment it’. Exactly the same words are used elsewhere in the Pāli canon (in the Mahāsaccaka Sutta, Bodhirājakumāra Sutta and Saṅgārava Sutta) in order to describe the futile attempts of the Buddha before his enlightenment to reach liberation after the manner of the Jainas. According to Bronkhorst, such practices which are based on a "suppression of activity" are not authentically Buddhist, but were later adopted from the Jains by the Buddhist community. The two major traditions of meditative practice in pre-Buddhist India were the Jain ascetic practices and the various Vedic Brahmanical practices. There is still much debate in Buddhist studies regarding how much influence these two traditions had on the development of early Buddhist meditation. The early Buddhist texts mention that Gautama trained under two teachers known as Āḷāra Kālāma and Uddaka Rāmaputta, both of them taught formless jhanas or mental absorptions, a key practice of proper Buddhist meditation. Alexander Wynne considers these figures historical persons associated with the doctrines of the early Upanishads. Other practices which the Buddha undertook have been associated with the Jain ascetic tradition by the Indologist Johannes Bronkhorst including extreme fasting and a forceful "meditation without breathing". According to the early texts, the Buddha rejected the more extreme Jain ascetic practices in favor of the middle way. The early Buddhist tradition also taught other meditation postures, such as the standing posture and the lion posture performed lying down on one side. Early Buddhism, as it existed before the development of various schools, is called pre-sectarian Buddhism. Its meditation-techniques are described in the Pali Canon and the Chinese Agamas. Asubha bhavana is reflection on "the foul"/unattractiveness (Pāli: asubha). It includes two practices, namely cemetery contemplations, and Paṭikkūlamanasikāra, "reflections on repulsiveness". Patikulamanasikara is a Buddhist meditation whereby thirty-one parts of the body are contemplated in a variety of ways. In addition to developing sati (mindfulness) and samādhi (concentration, dhyana), this form of meditation is considered to be conducive to overcoming desire and lust. Illustration of mindfulness of death using corpses in a charnel ground, a subset of mindfulness of the body, the first satipatthana. From an early 20th century manuscript found in Chaiya District, Surat Thani Province, Thailand. Anussati (Pāli; Sanskrit: Anusmriti) means "recollection," "contemplation," "remembrance," "meditation" and "mindfulness." It refers to specific meditative or devotional practices, such as recollecting the sublime qualities of the Buddha or anapanasati (mindfulness of breathing), which lead to mental tranquillity and abiding joy. In various contexts, the Pali literature and Sanskrit Mahayana sutras emphasize and identify different enumerations of recollections. An important quality to be cultivated by a Buddhist meditator is mindfulness (sati). Mindfulness is a polyvalent term which refers to remembering, recollecting and "bearing in mind". It also relates to remembering the teachings of the Buddha and knowing how these teachings relate to one's experiences. The Buddhist texts mention different kinds of mindfulness practice. According to Bronkhorst, there were originally two kinds of mindfulness, "observations of the positions of the body" and the four satipaṭṭhānas, the "establishment of mindfulness," which constituted formal meditation. Bhikkhu Sujato and Bronkhorst both argue that the mindfulness of the positions of the body wasn't originally part of the four satipatthana formula, but was later added to it in some texts. In the Pali Satipatthana Sutta and its parallels as well as numerous other early Buddhist texts, the Buddha identifies four foundations for mindfulness (satipaṭṭhānas): the body (including the four elements, the parts of the body, and death); feelings (vedana); mind (citta); and phenomena or principles (dhammas), such as the five hindrances and the seven factors of enlightenment. Different early texts give different enumerations of these four mindfulness practices. Meditation on these subjects is said to develop insight. Anapanasati, mindfulness of breathing, is a core meditation practice in Theravada, Tiantai and Chan traditions of Buddhism as well as a part of many mindfulness programs. In both ancient and modern times, anapanasati by itself is likely the most widely used Buddhist method for contemplating bodily phenomena. The Ānāpānasati Sutta specifically concerns mindfulness of inhalation and exhalation, as a part of paying attention to one's body in quietude, and recommends the practice of anapanasati meditation as a means of cultivating the Seven Factors of Enlightenment: sati (mindfulness), dhamma vicaya (analysis), viriya (persistence), which leads to pīti (rapture), then to passaddhi (serenity), which in turn leads to samadhi (concentration) and then to upekkhā (equanimity). Finally, the Buddha taught that, with these factors developed in this progression, the practice of anapanasati would lead to release (Pali: vimutti; Sanskrit mokṣa) from dukkha (suffering), in which one realizes nibbana. [P]robably the word "immortality" (a-mata) was used by the Buddha for the first interpretation of this experience and not the term cessation of suffering that belongs to the four noble truths [...] the Buddha did not achieve the experience of salvation by discerning the four noble truths and/or other data. But his experience must have been of such a nature that it could bear the interpretation "achieving immortality". Alexander Wynne agrees that the Buddha taught a kind of meditation exemplified by the four dhyanas, but argues that the Buddha adopted these from the Brahmin teachers Āḷāra Kālāma and Uddaka Rāmaputta, though he did not interpret them in the same Vedic cosmological way and rejected their Vedic goal (union with Brahman). The Buddha, according to Wynne, radically transformed the practice of dhyana which he learned from these Brahmins which "consisted of the adaptation of the old yogic techniques to the practice of mindfulness and attainment of insight". For Wynne, this idea that liberation required not just meditation but an act of insight, was radically different than the Brahminic meditation, "where it was thought that the yogin must be without any mental activity at all, ‘like a log of wood’." Fourth dhyana: upekkhāsatipārisuddhi[note 10] (purity of equanimity and mindfulness); neither-pleasure-nor-pain. According to Richard Gombrich, the sequence of the four rupa-jhanas describes two different cognitive states. [note 11] Alexander Wynne further explains that the dhyana-scheme is poorly understood. According to Wynne, words expressing the inculcation of awareness, such as sati, sampajāno, and upekkhā, are mistranslated or understood as particular factors of meditative states, whereas they refer to a particular way of perceiving the sense objects. [note 12][note 13] Polak notes that the qualities of the jhanas resemble the bojjhaṅgā, the seven factors of awakening]], arguing that both sets describe the same essential practice. Polak further notes, elaborating on Vetter, that the onset of the first dhyana is described as a quite natural process, due to the preceding efforts to restrain the senses and the nurturing of wholesome states. Upekkhā, equanimity, which is perfected in the fourth dhyana, is one of the four Brahma-vihara. While the commentarial tradition downplayed the Brahma-viharas, Gombrich notes that the Buddhist usage of the brahma-vihāra, originally referred to an awakened state of mind, and a concrete attitude toward other beings which was equal to "living with Brahman" here and now. The later tradition took those descriptions too literally, linking them to cosmology and understanding them as "living with Brahman" by rebirth in the Brahma-world. According to Gombrich, "the Buddha taught that kindness - what Christians tend to call love - was a way to salvation. The Dimension of neither perception nor non-perception (Pali nevasaññānāsaññāyatana, Skt. naivasaṃjñānāsaṃjñāyatana). Nirodha-samāpatti, also called saññā-vedayita-nirodha, 'extinction of feeling and perception'. These formless jhanas may have been incorporated from non-Buddhist traditions. Various early sources mention the attainment of insight after having achieved jhana. In the Mahasaccaka Sutta, dhyana is followed by insight into the four noble truths. The mention of the four noble truths as constituting "liberating insight" is probably a later addition. Discriminating insight into transiency as a separate path to liberation was a later development, under pressure of developments in Indian religious thinking, which saw "liberating insight" as essential to liberation. [page needed] This may also have been due to an over-literal interpretation by later scholastics of the terminology used by the Buddha, and to the problems involved with the practice of dhyana, and the need to develop an easier method. Equanimity (Pāli: upekkhā, Sanskrit: upekṣā): is even-mindedness and serenity, treating everyone impartially. The effect of cultivating the brahmavihāras as a liberation of the mind finds illustration in a simile which describes a conch blower who is able to make himself heard in all directions. This illustrates how the brahmavihāras are to be developed as a boundless radiation in all directions, as a result of which they cannot be overruled by other more limited karma. The practice of the four divine abodes can be seen as a way to overcome ill-will and sensual desire and to train in the quality of deep concentration (samadhi). Traditionally, Eighteen schools of Buddhism are said to have developed after the time of the Buddha. The Sarvastivada school was the most influential, but the Theravada is the only school that still exists. In the Pali canon, the Buddha never mentions independent samatha and vipassana meditation practices; instead, samatha and vipassana are two qualities of mind, to be developed through meditation. [note 15] Nonetheless, some meditation practices (such as contemplation of a kasina object) favor the development of samatha, others are conducive to the development of vipassana (such as contemplation of the aggregates), while others (such as mindfulness of breathing) are classically used for developing both mental qualities. they develop serenity and insight in tandem (Pali: samatha-vipassanam yuganaddham) as in, for instance, obtaining the first jhana, and then seeing in the associated aggregates the three marks of existence, before proceeding to the second jhana. While the Nikayas state that the pursuit of vipassana can precede the pursuit of samatha, according to the Burmese Vipassana movement vipassana be based upon the achievement of stabilizing "access concentration" (Pali: upacara samadhi). Through the meditative development of serenity, one is able to suppress obscuring hindrances; and, with the suppression of the hindrances, it is through the meditative development of insight that one gains liberating wisdom. Moreover, the Buddha is said to have extolled serenity and insight as conduits for attaining Nibbana (Pali; Skt. : Nirvana), the unconditioned state as in the "Kimsuka Tree Sutta" (SN 35.245), where the Buddha provides an elaborate metaphor in which serenity and insight are "the swift pair of messengers" who deliver the message of Nibbana via the Noble Eightfold Path. [note 16] In the Threefold training, samatha is part of samadhi, the eight limb of the threefold path, together withsati, mindfulness. The oldest material of the Theravāda tradition on meditation can be found in the Pali Nikayas, and in texts such as the Patisambhidamagga which provide commentary to meditation suttas like the Anapanasati sutta. An early Theravāda meditation manual is the Vimuttimagga ('Path of Freedom', 1st or 2nd century). The most influential presentation though, is that of the 5th Century Visuddhimagga ('Path of Purification') of Buddhaghoṣa, which seems to have been influenced by the earlier Vimuttimagga in his presentation. 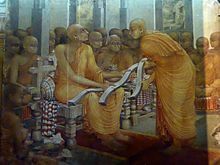 The Visuddhimagga's doctrine reflects Theravāda Abhidhamma scholasticism, which includes several innovations and interpretations not found in the earliest discourses (suttas) of the Buddha. Buddhaghosa's Visuddhimagga includes non-canonical instructions on Theravada meditation, such as "ways of guarding the mental image (nimitta)," which point to later developments in Theravada meditation. The text is centered around kasina-meditation, a form of concentration-meditation in which the mind is focused on a (mental) object. According to Thanissaro Bhikkhu, "[t]he text then tries to fit all other meditation methods into the mold of kasina practice, so that they too give rise to countersigns, but even by its own admission, breath meditation does not fit well into the mold." In its emphasis on kasina-meditation, the Visuddhimagga departs from the Pali Canon, in which dhyana is the central meditative practice, indicating that what "jhana means in the commentaries is something quite different from what it means in the Canon." ten kasinas: earth, water, fire, air, blue, yellow, red, white, light, and "limited-space". ten kinds of foulness: "the bloated, the livid, the festering, the cut-up, the gnawed, the scattered, the hacked and scattered, the bleeding, the worm-infested, and a skeleton". ten recollections: Buddhānussati, the Dhamma, the Sangha, virtue, generosity, the virtues of deities, death (see the Upajjhatthana Sutta), the body, the breath (see anapanasati), and peace (see Nibbana). four divine abodes: mettā, karuṇā, mudita, and upekkha. four immaterial states: boundless space, boundless perception, nothingness, and neither perception nor non-perception. When one overlays Buddhaghosa's 40 meditative subjects for the development of concentration with the Buddha's foundations of mindfulness, three practices are found to be in common: breath meditation, foulness meditation (which is similar to the Sattipatthana Sutta's cemetery contemplations, and to contemplation of bodily repulsiveness), and contemplation of the four elements. According to Pali commentaries, breath meditation can lead one to the equanimous fourth jhanic absorption. Contemplation of foulness can lead to the attainment of the first jhana, and contemplation of the four elements culminates in pre-jhana access concentration. The modern Thai Forest Tradition advocates practicing in the wilderness. The practice of meditation by Buddhist laypersons is a key feature of the modern vipassana movement. The role of samatha in Buddhist practice, and the exact menaing of samatta, are points of contention and investigation in contemporary Theravada and western vipassanan. Burmese vipassana teachers have tended to disregard samatta as unnecessary, while Thai teachers see samatha and vipassana as intertwined. The exact menaing of samatta is also not clear, and westerners have started to question the receive wisdom on this. While samatha is usually equated with the jhanas in the commentarial tradition, scholars and practitioners have pointed out that jhana is more than a narrowing of the focus of the mind. While the second jhana may be characterized by samadhi-ji, "born of concentration," the first jhana sets in quite naturally as a result of sense-restraint, while the third and fourth jhana are characterized by mindfulness and equanimity. Sati, sense-restraint and mindfulness are necessary preceding practices, while insight may mark the point where one enters the "stream" of development which results in vimukti, release. According to Anālayo, the jhanas are crucial meditative states which lead to the abandonment of hindrances such as lust and aversion; however, they are not sufficient for the attainment of liberating insight. Some early texts also warn meditators against becoming attached to them, and therefore forgetting the need for the further practice of insight. According to Anālayo, "either one undertakes such insight contemplation while still being in the attainment, or else one does so retrospectively, after having emerged from the absorption itself but while still being in a mental condition close to it in concentrative depth." The position that insight can be practiced from within jhana, according to the early texts, is endorsed by Gunaratna, Crangle and Shankaman. Anālayo meanwhile argues, that the evidence from the early texts suggest that "contemplation of the impermanent nature of the mental constituents of an absorption takes place before or on emerging from the attainment". Arbel has argued that insight precedes the practice of jhana. Particularly influential from the twentieth century onward has been the Burmese Vipassana movement, especially the "New Burmese Method" or "Vipassanā School" approach to samatha and vipassanā developed by Mingun Sayadaw and U Nārada and popularized by Mahasi Sayadaw. Here samatha is considered an optional but not necessary component of the practice—vipassanā is possible without it. Another Burmese method, derived from Ledi Sayadaw via Ba Khin and S. N. Goenka, takes a similar approach. Other Burmese traditions popularized in the west, notably that of Pa Auk Sayadaw, uphold the emphasis on samatha explicit in the commentarial tradition of the Visuddhimagga. These Burmese traditions have been influential on Western Theravada-oriented teachers, notably Joseph Goldstein, Sharon Salzberg and Jack Kornfield. There are also other less well known Burmese meditation methods, such as the system developed by U Vimala, which focuses on knowledge of dependent origination and cittanupassana (mindfulness of the mind). Likewise, Sayadaw U Tejaniya's method also focuses on mindfulness of the mind. Also influential is the Thai Forest Tradition deriving from Mun Bhuridatta and popularized by Ajahn Chah, which, in contrast, stresses the inseparability of the two practices, and the essential necessity of both practices. Other noted practitioners in this tradition include Ajahn Thate and Ajahn Maha Bua, among others. 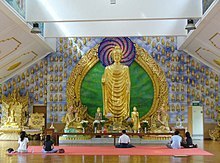 There are other forms of Thai Buddhist meditation associated with particular teachers, including Buddhadasa Bhikkhu's presentation of anapanasati, Ajahn Lee's breath meditation method (which influenced his American student Thanissaro) and the "dynamic meditation" of Luangpor Teean Cittasubho. There are other less mainstream forms of Theravada meditation practiced in Thailand which include the vijja dhammakaya meditation developed by Luang Pu Sodh Candasaro and the meditation of former supreme patriarch Suk Kai Thuean (1733–1822). Newell notes that these two forms of modern Thai meditation share certain features in common with tantric practices such as the use of visualizations and centrality of maps of the body. A less common type of meditation is practiced in Cambodia and Laos by followers of Borān kammaṭṭhāna ('ancient practices') tradition. This form of meditation includes the use of mantras and visualizations. The now defunct Sarvāstivāda tradition, and its related sub-schools like the Sautrāntika and the Vaibhāṣika, were the most influential Buddhists in North India and Central Asia. Their highly complex Abhidharma treatises, such as the Mahavibhasa, the Sravakabhumi and the Abhidharmakosha, contain new developments in meditative theory which had a major influence on meditation as practiced in East Asian Mahayana and Tibetan Buddhism. Individuals known as yogācāras (yoga practitioners) were influential in the development of Sarvāstivāda meditation praxis, and some modern scholars such as Yin Shun believe they were also influential in the development of Mahayana meditation. 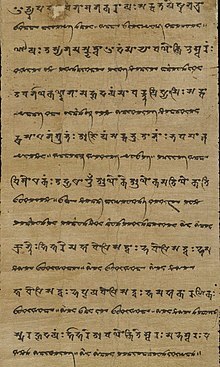 The Dhyāna sutras (Chinese: 禪経) or "meditation summaries" (Chinese: 禪要) are a group of early Buddhist meditation texts which are mostly based on the Yogacara[note 17] meditation teachings of the Sarvāstivāda school of Kashmir circa 1st-4th centuries CE, which focus on the concrete details of the meditative practice of the Yogacarins of northern Gandhara and Kashmir. Most of the texts only survive in Chinese and were key works in the development of the Buddhist meditation practices of Chinese Buddhism. contemplation on the impure (asubhabhavana), for the greedy type person. mindfulness of breathing (anapanasmrti), for the distracted type. purifying stage of the arising of insight. This sixfold breathing meditation method was influential in East Asia, and expanded upon by the Chinese Tiantai meditation master Zhiyi. After the practitioner has achieved tranquility, Sarvāstivāda Abhidharma then recommends one proceeds to practice the four applications of mindfulness (smrti-upasthāna) in two ways. First they contemplate each specific characteristic of the four applications of mindfulness, and then they contemplate all four collectively. In spite of this systematic division of samatha and vipasyana, the Sarvāstivāda Abhidharmikas held that the two practices are not mutually exclusive. The Mahavibhasa for example remarks that, regarding the six aspects of mindfulness of breathing, "there is no fixed rule here — all may come under samatha or all may come under vipasyana." The Sarvāstivāda Abhidharmikas also held that attaining the dhyānas was necessary for the development of insight and wisdom. Asaṅga, a Mahayana scholar who wrote numerous works and is believed to have contributed to the development of the Yogācārabhūmi. Mahāyāna practice is centered on the path of the bodhisattva, a being which is aiming for full Buddhahood. Meditation (dhyāna) is one of the transcendent virtues (paramitas) which a bodhisattva must perfect in order to reach Buddhahood, and thus, it is central to Mahāyāna Buddhist praxis. Indian Mahāyāna Buddhism was initially a network of loosely connected groups and associations, each drawing upon various Buddhist texts, doctrines and meditation methods. Because of this, there is no single set of Indian Mahāyāna practices which can be said to apply to all Indian Mahāyānists, nor is there is a single set of texts which were used by all of them. Textual evidence shows that many Mahāyāna Buddhists in northern India as well as in Central Asia practiced meditation in a similar way to that of the Sarvāstivāda school outlined above. This can be seen in what is probably the most comprehensive and largest Indian Mahāyāna treatise on meditation practice, the Yogācārabhūmi-Śāstra (compiled c. 4th century), a compendium which explains in detail Yogācāra meditation theory, and outlines numerous meditation methods as well as related advice. Among the topics discussed are the various early Buddhist meditation topics such as the four dhyānas, the different kinds of samādhi, the development of insight (vipaśyanā) and tranquility (śamatha), the four foundations of mindfulness (smṛtyupasthāna), the five hindrances (nivaraṇa), and classic Buddhist meditations such as the contemplation of unattractiveness (aśubhasaṃjnā), impermanence (anitya), suffering (duḥkha), and contemplation death (maraṇasaṃjñā). Other works of the Yogācāra school, such as Asaṅga's Abhidharmasamuccaya, and Vasubandhu's Madhyāntavibhāga-bhāsya also discuss meditation topics such as mindfulness, smṛtyupasthāna, the 37 wings to awakening, and samadhi. Some Mahāyāna sutras also teach early Buddhist meditation practices. For example, the Mahāratnakūṭa Sūtra and the Mahāprajñāpāramitā Sūtra both teach the four foundations of mindfulness. entails not only not clinging to the five aggregates as representative of all phenomena, but also not clinging to the very notion of the five aggregates, their existence or non-existence, their impermanence or eternality, their being dissatisfactory or satisfactory, their emptiness or self-hood, their generation or cessation, and so forth with other antithetical pairs. To so mistakenly perceive the aggregates is to “course in a sign” (nimite carati; xíng xiāng 行相), i.e. to engage in the signs and conceptualization of phenomena, and not to course in Prajñāpāramitā. Even to perceive of oneself as a bodhisattva who courses, or the Prajñāpāramitā in which one courses, are likewise coursing in signs. Other Indian Mahāyāna texts show new innovative methods which were unique to Mahāyāna Buddhism. Texts such as the Pure Land sutras, the Akṣobhya-vyūha Sūtra and the Pratyutpanna Samādhi Sūtra teach meditations on a particular Buddha (such as Amitābha or Akshobhya). Through the repetition of their name or some other phrase and certain visualization methods, one is said to be able to meet a Buddha face to face or at least to be reborn in a Buddha field (also known as "Pure land") like Abhirati and Sukhavati after death. The Pratyutpanna sutra for example, states that if one practices recollection of the Buddha (Buddhānusmṛti) by visualizing a Buddha in their Buddha field and developing this samadhi for some seven days, one may be able to meet this Buddha in a vision or a dream so as to learn the Dharma from them. Alternatively, being reborn in one of their Buddha fields allows one to meet a Buddha and study directly with them, allowing one to reach Buddhahood faster. A set of sutras known as the Visualization Sutras also depict similar innovative practices using mental imagery. These practices been seen by some scholars as a possible explanation for the source of certain Mahāyāna sutras which are seen traditionally as direct visionary revelations from the Buddhas in their pure lands. Another popular practice was the memorization and recitation of various texts, such as sutras, mantras and dharanis. According to Akira Hirakawa, the practice of reciting dharanis (chants or incantations) became very important in Indian Mahāyāna. These chants were believed to have "the power to preserve good and prevent evil", as well as being useful to attain meditative concentration or samadhi. Important Mahāyāna sutras such as the Lotus Sutra, Heart Sutra and others prominently include dharanis. Ryûichi Abé states that dharanis are also prominent in the Prajñāpāramitā Sutras wherein the Buddha "praises dharani incantation, along with the cultivation of samadhi, as virtuous activity of a bodhisattva". They are also listed in the Mahāprajñāpāramitōpadeśa, chapter X, as an important quality of a bodhisattva. A later Mahāyāna work which discusses meditation practice is Shantideva's Bodhicaryāvatāra (8th century) which depicts how a bodhisattva's meditation was understood in the later period of Indian Mahāyāna. Shantideva begins by stating that isolating the body and the mind from the world (ie from discursive thoughts) is necessary for the practice of meditation, which must begin with the practice of tranquility (śamatha). He promotes classic practices like meditating on corpses and living in forests, but these are preliminary to the Mahāyāna practices which initially focus on generating bodhicitta, a mind intent on awakening for the benefit of all beings. An important of part of this practice is to cultivate and practice the understanding that oneself and other beings are actually the same, and thus all suffering must be removed, not just "mine". This meditation is termed by Shantideva "the exchange of self and other" and it is seen by him as the apex of meditation, since it simultaneously provides a basis for ethical action and cultivates insight into the nature of reality, i.e. emptiness. Another late Indian Mahāyāna meditation text is Kamalaśīla's Bhāvanākrama ( "stages of meditation", 9th century), which teaches insight (vipaśyanā) and tranquility (śamatha) from a Yogācāra-Madhyamaka perspective. The meditation forms practiced during the initial stages of Chinese Buddhism did not differ much from those of Indian Mahayana Buddhism, though they did contain developments that could have arisen in Central Asia. The works of the Chinese translator An Shigao (安世高, 147-168 CE) are some of the earliest meditation texts used by Chinese Buddhism and their focus is mindfulness of breathing (annabanna 安那般那). The Chinese translator and scholar Kumarajiva (344–413 CE) transmitted various meditation works, including a meditation treatise titled The Sūtra Concerned with Samādhi in Sitting Meditation (坐禅三昧经, T.614, K.991) which teaches the Sarvāstivāda system of fivefold mental stillings. These texts are known as the Dhyāna sutras. They reflect the meditation practices of Kashmiri Buddhists, influenced by Sarvāstivāda and Sautrantika meditation teachings, but also by Mahayana Buddhism. The East Asian Yogācāra school or "Consciousness only school" (Ch. Wéishí-zōng), known in Japan as the Hossō school was a very influential tradition of Chinese Buddhism. They practiced several forms of meditation. According to Alan Sponberg, they included a class of visualization exercises, one of which centered on constructing a mental image of the Bodhisattva (and presumed future Buddha) Maitreya in Tusita heaven. A biography the Chinese Yogācāra master and translator Xuanzang depicts him practicing this kind of meditation. The goal of this practice seems to have been rebirth in Tusita heaven, so as to meet Maitreya and study Buddhism under him. The attainment of Nirvāṇa is realizable by many methods whose essentials do not go beyond the practice of śamatha and vipaśyanā. Śamatha is the first step to untie all bonds and vipaśyanā is essential to root out delusion. Śamatha provides nourishment for the preservation of the knowing mind, and vipaśyanā is the skillful art of promoting spiritual understanding. Śamatha is the unsurpassed cause of samādhi, while vipaśyanā begets wisdom. The Tiantai school also places a great emphasis on ānāpānasmṛti, or mindfulness of breathing, in accordance with the principles of śamatha and vipaśyanā. Zhiyi classifies breathing into four main categories: panting (喘), unhurried breathing (風), deep and quiet breathing (氣), and stillness or rest (息). Zhiyi holds that the first three kinds of breathing are incorrect, while the fourth is correct, and that the breathing should reach stillness and rest. Zhiyi also outlines four kinds of samadhi in his Mohe Zhiguan, and ten modes of practicing vipaśyanā. One of the adaptations by the Japanese Tendai school was the introduction of Mikkyō (esoteric practices) into Buddhism, which was later named Taimitsu by Ennin. Eventually, according to Tendai Taimitsu doctrine, the esoteric rituals came to be considered of equal importance with the exoteric teachings of the Lotus Sutra. Therefore, by chanting mantras, maintaining mudras, or performing certain meditations, one is able to see that the sense experiences are the teachings of Buddha, have faith that one is inherently an enlightened being, and one can attain enlightenment within this very body. The origins of Taimitsu are found in China, similar to the lineage that Kūkai encountered in his visit to Tang China and Saichō's disciples were encouraged to study under Kūkai. The Huayan school was a major school of Chinese Buddhism, which also strongly influenced Chan Buddhism. An important element of their meditation theory and practice is what was called the "Fourfold Dharmadhatu" (sifajie, 四法界). Dharmadhatu (法界) is the goal of the bodhisattva's practice, the ultimate nature of reality or deepest truth which must be known and realized through meditation. According to Fox, the Fourfold Dharmadhatu is "four cognitive approaches to the world, four ways of apprehending reality". Huayan meditation is meant to progressively ascend through these four "increasingly more holographic perspectives on a single phenomenological manifold." All dharmas are seen as particular separate events or phenomena (shi 事). This is the mundane way of seeing. All events are an expression of li (理, the absolute, principle or noumenon), which is associated with the concepts of shunyata, “One Mind” (yi xin 一心) and Buddha nature. This level of understanding or perspective on reality is associated with the meditation on "true emptiness". Shi and Li interpenetrate (lishi wuai 理事無礙), this is illuminated by the meditation on the "non-obstruction of principle and phenomena." 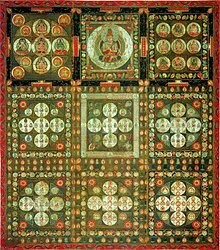 According to Paul Williams, the reading and recitation of the Avatamsaka sutra was also a central practice for the tradition, for monks and laity. In Pure Land Buddhism, repeating the name of Amitābha is traditionally a form of mindfulness of the Buddha (Skt. buddhānusmṛti). This term was translated into Chinese as nianfo (Chinese: 念佛), by which it is popularly known in English. The practice is described as calling the buddha to mind by repeating his name, to enable the practitioner to bring all his or her attention upon that Buddha (samādhi). This may be done vocally or mentally, and with or without the use of Buddhist prayer beads. Those who practice this method often commit to a fixed set of repetitions per day, often from 50,000 to over 500,000. Repeating the Pure Land Rebirth dhāraṇī is another method in Pure Land Buddhism. Similar to the mindfulness practice of repeating the name of Amitābha Buddha, this dhāraṇī is another method of meditation and recitation in Pure Land Buddhism. The repetition of this dhāraṇī is said to be very popular among traditional Chinese Buddhists. Another practice found in Pure Land Buddhism is meditative contemplation and visualization of Amitābha, his attendant bodhisattvas, and the Pure Land. The basis of this is found in the Amitāyurdhyāna Sūtra ("Amitābha Meditation Sūtra"). During sitting meditation (坐禅, Ch. zuòchán, Jp. zazen, Ko. jwaseon), practitioners usually assume a position such as the lotus position, half-lotus, Burmese, or seiza, often using the dhyāna mudrā. Often, a square or round cushion placed on a padded mat is used to sit on; in some other cases, a chair may be used. Various techniques and meditation forms are used in the different Zen traditions. Mindfulness of breathing is a common practice, used to develop mental focus and concentration. Another common form of sitting meditation is called "Silent illumination" (Ch. mòzhào, Jp. mokushō). This practice was traditionally promoted by the Caodong school of Chinese Chan and is associated with Hongzhi Zhengjue (1091—1157). In Hongzhi's practice of "nondual objectless meditation" the mediator strives to be aware of the totality of phenomena instead of focusing on a single object, without any interference, conceptualizing, grasping, goal seeking, or subject-object duality. This practice is also popular in the major schools of Japanese Zen, but especially Sōtō, where it is more widely known as Shikantaza (Ch. zhǐguǎn dǎzuò, "Just sitting"). During the Sòng dynasty, a new meditation method was popularized by figures such as Dahui, which was called kanhua chan ("observing the phrase" meditation) which referred to contemplation on a single word or phrase (called the huatou, "critical phrase") of a gōng'àn (Koan). In Chinese Chan and Korean Seon, this practice of "observing the huatou" (hwadu in Korean) is a widely practiced method. In the Japanese Rinzai school, kōan introspection developed its own formalized style, with a standardized curriculum of kōans which must be studies and "passed" in sequence. This process includes standardized questions and answers during a private interview with one's Zen teacher. Kōan-inquiry may be practiced during zazen (sitting meditation), kinhin (walking meditation), and throughout all the activities of daily life. The goal of the practice is often termed kensho (seeing one's true nature). Kōan practice is particularly emphasized in Rinzai, but it also occurs in other schools or branches of Zen depending on the teaching line. 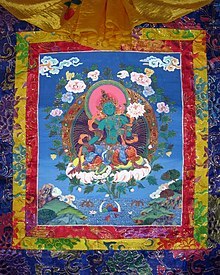 Meditation through the use of complex guided imagery based on Buddhist deities like Tara is a key practice in Vajrayana. Visual aids such as this thangka are often used. Tantric Buddhism (Esoteric Buddhism or Mantrayana) refers to various traditions which developed in India from the fifth century onwards and then spread to the Himalayan regions and East Asia. In the Tibetan tradition, it is also known as Vajrayāna, while in China it is known as Zhenyan (Ch: 真言, "true word", "mantra"), as well as Mìjiao (Esoteric Teaching), Mìzōng ("Esoteric Tradition") or Tángmì ("Tang Esoterica"). Tantric Buddhism generally includes all of the traditional forms of Mahayana meditation, but its focus is on several unique and special forms of "tantric" or "esoteric" meditation practices, which are seen as faster and more efficacious. These Tantric Buddhist forms are derived from texts called the Buddhist Tantras. To practice these advanced techniques, one is generally required to be initiated into the practice by an esoteric master (Sanskrit: acarya) or guru (Tib. lama) in a ritual consecration called abhiseka (Tib. wang). In Tibetan Buddhism, the central defining form of Vajrayana meditation is Deity Yoga (devatayoga). This involves the recitation of mantras, prayers and visualization of the yidam or deity (usually the form of a Buddha or a bodhisattva) along with the associated mandala of the deity's Pure Land. Advanced Deity Yoga involves imagining yourself as the deity and developing "divine pride", the understanding that oneself and the deity are not separate. Other forms of meditation in Tibetan Buddhism include the Mahamudra and Dzogchen teachings, each taught by the Kagyu and Nyingma lineages of Tibetan Buddhism respectively. The goal of these is to familiarize oneself with the ultimate nature of mind which underlies all existence, the Dharmakāya. There are also other practices such as Dream Yoga, Tummo, the yoga of the intermediate state (at death) or bardo, sexual yoga and chöd. The shared preliminary practices of Tibetan Buddhism are called ngöndro, which involves visualization, mantra recitation, and many prostrations. Chinese esoteric Buddhism focused on a separate set of tantras than Tibetan Buddhism (such as the Mahavairocana Tantra and Vajrasekhara Sutra), and thus their practices are drawn from these different sources, though they revolve around similar techniques such as visualization of mandalas, mantra recitation and use of mudras. This also applies for the Japanese Shingon school and the Tendai school (which , though derived from the Tiantai school, also adopted esoteric practices). 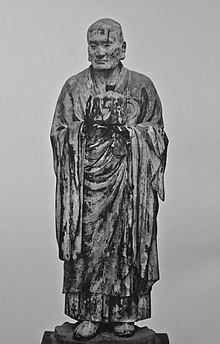 In the East Asian tradition of esoteric praxis, the use of mudra, mantra and mandala are regarded as the "three modes of action" associated with the "Three Mysteries" (sanmi 三密) are seen as the hallmarks of esoteric Buddhism. For a long time people have practiced meditation, based on Buddhist meditation principles, in order to effect mundane and worldly benefit. As such, mindfulness and other Buddhist meditation techniques are being advocated in the West by innovative psychologists and expert Buddhist meditation teachers such as Thích Nhất Hạnh, Pema Chödrön, Clive Sherlock, Mya Thwin, S. N. Goenka, Jon Kabat-Zinn, Jack Kornfield, Joseph Goldstein, Tara Brach, Alan Clements, and Sharon Salzberg, who have been widely attributed with playing a significant role in integrating the healing aspects of Buddhist meditation practices with the concept of psychological awareness, healing, and well-being. Although mindfulness meditation has received the most research attention, loving kindness (metta) and equanimity (upekkha) meditation are beginning to be used in a wide array of research in the fields of psychology and neuroscience. The accounts of meditative states in the Buddhist texts are in some regards free of dogma, so much so that the Buddhist scheme has been adopted by Western psychologists attempting to describe the phenomenon of meditation in general. [note 18] However, it is exceedingly common to encounter the Buddha describing meditative states involving the attainment of such magical powers (Sanskrit ṛddhi, Pali iddhi) as the ability to multiply one's body into many and into one again, appear and vanish at will, pass through solid objects as if space, rise and sink in the ground as if in water, walking on water as if land, fly through the skies, touching anything at any distance (even the moon or sun), and travel to other worlds (like the world of Brahma) with or without the body, among other things, and for this reason the whole of the Buddhist tradition may not be adaptable to a secular context, unless these magical powers are seen as metaphorical representations of powerful internal states that conceptual descriptions could not do justice to. Seventeen tantras – Major Tibetan Dzogchen texts. The Wangchuk Dorje's "Ocean of Definitive Meaning", major text on Tibetan Mahamudra meditation in the Kagyu school. Dakpo Tashi Namgyal's "Mahamudra: The Moonlight – Quintessence of Mind and Meditation"
Fukan-zazengi (Advice on Zazen) – By Dogen, used in the Japanese Soto Zen school. ^ * Kamalashila (2003), p. 4, states that Buddhist meditation "includes any method of meditation that has awakening as its ultimate aim." * Bodhi (1999): "To arrive at the experiential realization of the truths it is necessary to take up the practice of meditation [...] At the climax of such contemplation the mental eye [...] shifts its focus to the unconditioned state, Nibbana." * Fischer-Schreiber et al. (1991), p. 142: "Meditation – general term for a multitude of religious practices, often quite different in method, but all having the same goal: to bring the consciousness of the practitioner to a state in which he can come to an experience of 'awakening,' 'liberation,' 'enlightenment.'" * Kamalashila (2003) further allows that some Buddhist meditations are "of a more preparatory nature" (p. 4). The forty concentrative meditation subjects refer to Visuddhimagga's oft-referenced enumeration. ^ Polak refers to Vetter, who noted that in the suttas right effort leads to a calm state of mind. When this calm and self-restraint had been reached, the Buddha is described as sitting down and attaining the first jhana, in an almost natural way. According to Fox, referring to Rhys Davids and Stede, when vitarka-vicara are mentioned in tandem, they are one expression, "to cover all' varieties of thinking, including sustained and focused thought. It is thinking in this inclusive sense that the meditator suppresses through concentration when he attains one-ness of mind and thus moves from first to second jhana." ^ The common translation, based on the commentarial interpretation of dhyana as expanding states of absorption, translates sampasadana as "internal assurance." Yet, as Bucknell explains, it also means "tranquilizing," which is more apt in this context. ^ Upekkhā is one of the Brahmaviharas. ^ Gombrich: "I know this is controversial, but it seems to me that the third and fourth jhanas are thus quite unlike the second." ^ Wynne: "Thus the expression sato sampajāno in the third jhāna must denote a state of awareness different from the meditative absorption of the second jhāna (cetaso ekodibhāva). It suggests that the subject is doing something different from remaining in a meditative state, i.e., that he has come out of his absorption and is now once again aware of objects. The same is true of the word upek(k)hā: it does not denote an abstract 'equanimity', [but] it means to be aware of something and indifferent to it [...] The third and fourth jhāna-s, as it seems to me, describe the process of directing states of meditative absorption towards the mindful awareness of objects. ^ According to Gombrich, "the later tradition has falsified the jhana by classifying them as the quintessence of the concentrated, calming kind of meditation, ignoring the other - and indeed higher - element. ^ These definitions of samatha and vipassana are based on the "Four Kinds of Persons Sutta" (AN 4.94). This article's text is primarily based on Bodhi (2005), pp. 269-70, 440 n. 13. See also Thanissaro (1998d). ^ See Thanissaro (1997) where for instance he underlines: "When [the Pali discourses] depict the Buddha telling his disciples to go meditate, they never quote him as saying 'go do vipassana,' but always 'go do jhana.' And they never equate the word vipassana with any mindfulness techniques. In the few instances where they do mention vipassana, they almost always pair it with samatha – not as two alternative methods, but as two qualities of mind that a person may 'gain' or 'be endowed with,' and that should be developed together." ^ Bodhi (2000), pp. 1251-53. See also Thanissaro (1998c) (where this sutta is identified as SN 35.204). See also, for instance, a discourse (Pali: sutta) entitled, "Serenity and Insight" (SN 43.2), where the Buddha states: "And what, bhikkhus, is the path leading to the unconditioned? Serenity and insight...." (Bodhi, 2000, pp. 1372-73). ^ To be distinguished from the Mahayana Yogacara school, though they may have been a precursor. ^ Michael Carrithers, The Buddha, 1983, pages 33-34. Found in Founders of Faith, Oxford University Press, 1986. The author is referring to Pali literature. See however B. Alan Wallace, The bridge of quiescence: experiencing Tibetan Buddhist meditation. Carus Publishing Company, 1998, where the author demonstrates similar approaches to analyzing meditation within the Indo-Tibetan and Theravada traditions. ^ a b c Deleanu, Florin (1992); Mindfulness of Breathing in the Dhyāna Sūtras. Transactions of the International Conference of Orientalists in Japan (TICOJ) 37, 42-57. ^ a b Bronkhorst, Johannes (1993), The Two Traditions Of Meditation In Ancient India, Motilal Banarsidass Publ. ^ a b Bronkhorst 2012, p. 2. ^ Bronkhorst 2012, p. 4. ^ Anālayo, Early Buddhist Meditation Studies, 2017, p. 165. ^ Bronkhorst, Johannes, The two traditions of meditation in Ancient India, Second edition: Delhi: Motilal Banarsidass. 1993. (Reprint: 2000), p. 10. ^ a b c d Vetter 1988. ^ a b Vetter 1988, p. XXV. ^ a b c d Polak 2011. ^ Nanamoli (1998), p. 110, n. 16, which references the Anapanasati Sutta and the Visuddhimagga, Ch. VI, VIII. ^ a b Bhikkhu Sujato, A History of Mindfulness How insight worsted tranquillity in the Satipaṭṭhāna Sutta, Santipada, p. 148. ^ For instance, see Solé-Leris (1986), p. 75; and, Goldstein (2003), p. 92. ^ Anālayo 2003, p. 125. ^ vetter 1988, p. 5-6. ^ "Ariyapariyesana Sutta, The Noble Search". ^ Bucknell 1993, p. 375-376. ^ Fox 1989, p. 82. ^ Vetter, 1988 & p. XXVI, note 9. ^ a b c Wynne 2007, p. 140, note 58. ^ a b c Wynne 2007, p. 106. ^ Wynne 2007, p. 106-107. ^ Gombrich 1997, p. 84-85. ^ Gombrich 1997, p. 62. ^ a b Bronkhorst 1993. ^ a b Wynne 2007. ^ Vetter 1988, p. xxxiv–xxxvii. ^ Gombrich 1997, p. 96-134. ^ Vetter 1988, p. xxxv. ^ Anālayo, Early Buddhist Meditation Studies, Barre Center for Buddhist Studies Barre, Massachusetts USA 2017, p 185. ^ a b c d Merv Fowler (1999). Buddhism: Beliefs and Practices. Sussex Academic Press. pp. 60–62. ISBN 978-1-898723-66-0. ^ a b c Peter Harvey (2012). An Introduction to Buddhism: Teachings, History and Practices. Cambridge University Press. pp. 154, 326. ISBN 978-1-139-85126-8. ^ Anālayo, Early Buddhist Meditation Studies, Barre Center for Buddhist Studies Barre, Massachusetts USA 2017, p 186. ^ Anālayo, Early Buddhist Meditation Studies, Barre Center for Buddhist Studies Barre, Massachusetts USA 2017, p 194. ^ See, for instance, Bodhi (1999) and Nyanaponika (1996), p. 108. ^ Bodhi (2005), pp. 268, 439 nn. 7, 9, 10. See also Thanissaro (1998f). ^ See, for instance, AN 2.30 in Bodhi (2005), pp. 267-68, and Thanissaro (1998e). ^ Sujato, A History of Mindfulness How insight worsted tranquillity in the Satipaṭṭhāna Sutta, Santipada, p. 329. ^ Shaw 2006, p. 5. ^ Sarah Shaw, Buddhist meditation: an anthology of texts from the Pāli canon. Routledge, 2006, pages 6-8. A Jataka tale gives a list of 38 of them. .
^ Buddhaghosa & Nanamoli (1999), pp. 85, 90. ^ Buddhaghoṣa & Nanamoli (1999), p. 110. ^ Regarding the jhanic attainments that are possible with different meditation techniques, see Gunaratana (1988). ^ Tiyavanich K. Forest Recollections: Wandering Monks in Twentieth-Century Thailand. University of Hawaii Press, 1997. ^ Suen, Stephen, Methods of spiritual praxis in the Sarvāstivāda: A Study Primarily Based on the Abhidharma-mahāvibhāṣā, The University of Hong Kong 2009, p. 67. ^ a b Bhikkhu KL Dhammajoti, Sarvāstivāda-Abhidharma, Centre of Buddhist Studies The University of Hong Kong 2007, p 575-576. ^ Suen, Stephen, Methods of spiritual praxis in the Sarvāstivāda: A Study Primarily Based on the Abhidharma-mahāvibhāṣā, The University of Hong Kong 2009, p. 177. ^ Suen, Stephen, Methods of spiritual praxis in the Sarvāstivāda: A Study Primarily Based on the Abhidharma-mahāvibhāṣā, The University of Hong Kong 2009, p. 191. ^ a b Bhikkhu KL Dhammajoti, Sarvāstivāda-Abhidharma, Centre of Buddhist Studies The University of Hong Kong 2007, p 577. ^ Ulrich Timme Kragh (editor), The Foundation for Yoga Practitioners: The Buddhist Yogācārabhūmi Treatise and Its Adaptation in India, East Asia, and Tibet, Volume 1 Harvard University, Department of South Asian studies, 2013, pp. 51, 60 - 230. ^ Sujato, A History of Mindfulness How insight worsted tranquillity in the Satipaṭṭhāna Sutta, Santipada, 2005, p. 363-4. ^ Sujato, A History of Mindfulness How insight worsted tranquillity in the Satipaṭṭhāna Sutta, Santipada, 2005, p. 356. ^ Akira Hirakawa, A History of Indian Buddhism: From Śākyamuni to Early Mahāyāna, Motilal Banarsidass Publ., 1993, p. 301. ^ a b "Maha Prajnaparamita Sastra by Gelongma Karma Migme Chödrön". Wisdom Library. 2001. ^ Orsborn, Matthew Bryan. “Chiasmus in the Early Prajñāpāramitā: Literary Parallelism Connecting Criticism & Hermeneutics in an Early Mahāyāna Sūtra”, University of Hong Kong , 2012, pp. 181-182, 188. ^ Huifeng Shi, An Annotated English Translation of Kumārajīva’s Xiaŏpĭn Prajñāpāramitā Sūtra, Asian Literature and Translation ISSN 2051-5863 https://doi.org/10.18573/issn.2051-5863 Vol 4, No. 1, 2017, 187-238. ^ Williams, Paul. Mahayana Buddhism the doctrinal foundations, 2nd edition, 2009, p. 40. ^ Akira Hirakawa, A History of Indian Buddhism: From Śākyamuni to Early Mahāyāna, Motilal Banarsidass Publ., 1993, p. 300. ^ a b Ryûichi Abé (1999). The Weaving of Mantra: Kûkai and the Construction of Esoteric Buddhist Discourse. Columbia University Press. pp. 164–168. ISBN 978-0-231-52887-0. ^ Robert N. Linrothe (1999). Ruthless Compassion: Wrathful Deities in Early Indo-Tibetan Esoteric Buddhist Art. Serindia Publications. pp. 56–59. ISBN 978-0-906026-51-9. ^ a b Takeuchi Yoshinori (editor), Buddhist Spirituality: Indian, Southeast Asian, Tibetan, and Early Chinese, Motilal Banarsidass Publishe, 1995, pp. 61-62. ^ Adam, Martin T. Meditation and the Concept of Insight in Kamalashila's Bhavanakramas, 2002. ^ Bhante Dhammadipa, KUMĀRAJĪVA’S MEDITATIVE LEGACY IN CHINA, 2015. ^ Gregory, Peter N. (editor), Traditions of Meditation in Chinese Buddhism, University of Hawaii Press, 1986, pp. 23-28. ^ Gregory, Peter N. (editor), Traditions of Meditation in Chinese Buddhism, University of Hawaii Press, 1986, p. 30. ^ Gregory, Peter N. (editor), Traditions of Meditation in Chinese Buddhism, University of Hawaii Press, 1986, pp. 32-34. ^ Wu, Rujun (1993). T'ien-t'ai Buddhism and Early Mādhyamika. University of Hawaii Press. ISBN 978-0-8248-1561-5. ^ Abe, Ryūichi (2013). The Weaving of Mantra: Kūkai and the Construction of Esoteric Buddhist Discourse. Columbia University Press. p. 45. ISBN 978-0-231-52887-0. ^ Williams, Paul. Mahayana Buddhism the doctrinal foundations, 2nd edition, 2009, page 145. ^ Katsuki Sekida, Zen Training: Methods and Philosophy, Shambhala Publications, 2005, p. 60. ^ Buswell, Robert E. (1991). Tracing Back the Radiance: Chinul's Korean Way of Zen (Classics in East Asian Buddhism). University of Hawaii Press. pp. 68–69. ISBN 0824814274. ^ Bodiford, William M. (2006). Koan practice. In: "Sitting with Koans". Ed. John Daido Loori. Somerville, MA: Wisdom Publications, p. 94. ^ Orzech, Charles D. (general editor) (2011). Esoteric Buddhism and the Tantras in East Asia. Brill, p. 85. ^ See, for instance, Zongmi's description of bonpu and gedō zen, described further below. ^ Hutcherson, Cendri (2008-05-19). "Loving-Kindness Meditation Increases Social Connectedness" (PDF). Emotion. 8 (5): 720–724. CiteSeerX 10.1.1.378.4164. doi:10.1037/a0013237. ^ Brahmana, Metteyya (2008-05-19). "New Equanimity Meditation and Tools from Psychology to Test Its Effectiveness". doi:10.13140/RG.2.1.3810.1365. Gunaratana, Henepola (1988), The Jhanas in Theravada Buddhist Meditation (Wheel No. 351/353). Kandy, Sri Lanka: Buddhist Publication Society. ISBN 955-24-0035-X. Nyanaponika Thera (1996), The Heart of Buddhist Meditation. York Beach, ME: Samuel Weiser, Inc. ISBN 0-87728-073-8.